Emergency managers from local, state, and federal departments came together recently in Baltimore and a demonstration of Mobile EAS piqued the interest of emergency managers from all corners of the preparedness and disaster response community at the event. The October emergency preparedness conference was sponsored by the Local Emergency Planning Committee of the City of Baltimore and by the Department of Homeland Security, Federal Emergency Management Administration, and the U.S. Department of Transportation. 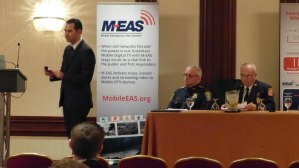 Mobile EAS demonstrations at the Baltimore event showed the benefits of the one-to-many broadcast technology. When it comes to emergency communication and alerting, more ways to reach more people is what everyone is looking for. And as attendees at the emergency management conference learned, Mobile EAS offers a way to reach more people at one time without the constrictions inherent in cell phone networks. First responders often face communications challenges, particularly during major incident response. In his general session address, Colm Lydon, Deputy Superintendent of the Boston Police Department, recounted the communication problems that he and the other first responders had faced directly after the Marathon bombing last April. The two-way radios used by the police and fire department radios — while fully functional — were jammed with multiple people trying to speak at once. A lot of conflicting information was initially being given. Later it became clear that there were two separate blast sites, hence the initial conflicting information. But with their communication issues, this took some time to establish. Lydon described his unsuccessful attempts to contact a District Chief of the Boston Fire Department by cell phone. All cell networks were overloaded and some reports later claimed that the cell networks were actually turned off so as to inhibit their use to potentially detonate additional devices. Lydon noted that had Mobile EAS been fully deployed and functioning in Boston during the bombing it could have been used in two ways – as an encrypted communication feed to first responders and as an alert information pathway to the thousands of terrified bystanders caught in the midst of the mayhem. An encrypted communication channel to first responders would be able to send out to specific mobile devices any information that the command post deems necessary, including video from cameras around the city or from police helicopters. By using the Mobile DTV broadcasts to send large data and video files, available cellular spectrum could conceivably be reserved for voice and text communication between first responders. Fiona James is Project Director for Convergence Services, Inc.